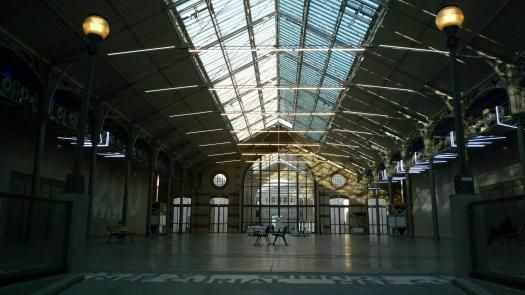 A Place for exceptional artistic creation, CENTQUATRE-PARIS took over the former Paris municipal funeral parlors in 2008, covering an area of about 25,000 square meters (11,000 m² can be used) situated between 104 rue d'Aubervilliers and 5 rue Curial in the 19 arrondissement. An artistic establishment owned by the city of Paris directed by José-Manuel Gonçalvès, le CENTQUATRE is a residential space of production and distribution for the public and artists worldwide. Conceived as a collaborative artistic platform, it gives everyone access to an ensemble of contemporary art practices. This is done through a resolutely popular programme, both contemporary and demanding. It is also a place to live with shops and spaces devoted to amateur artistic practices and early childhood. This exceptional site, both in its architecture and size, offers artists working and production spaces adapted in terms of surface and equipment according to the contemporary demands of creation. CENTQUATRE-PARIS initiates all kinds of artistic projects, without hierarchy: theatre, dance, music, cinema, video, and also culinary, digital and urban arts… It accompanies all projects via its programme "collaborative platforms" and the presence of resident artists all through the year. Located in the heart of the Flandre quarter, situated at the symbolic borderline of the capital and its neighboring suburbs, a territory rich in people and cultures, CENTQUATRE PARIS features a public service artistic space. It establishes direct relations with the locals. Outside its walls, it weaves numerous partnerships with associations, schools, social actors or groups from surroundings areas. Centquatre Paris offers a strong cultural effervescence in the neighborhood in the north east of Paris and has managed to integrate into the urban life of the neighborhood. CENTQUATRE-PARIS works equally with business men and women, designers and researchers working to promote "innovation by creation or creation by innovation". It supports the emergence of originals ideas, experimentation and creation. A space for artistic programmes and creation, experiments and innovation, CENTQUATRE is a genuine place of living and of conviviality for both artists and the public. You love this artistic atmosphere? Don't miss the other contemporary art galleries of North-East Paris: CNEAI in Magasins Généraux, Maison Populaire art center of Montreuil, Mains d'Oeuvres in Saint Ouen and the Untilthen gallery. Check out or list of hotels near the 104 in Paris 19th arrondissement.